Still dull here but with a bit of sun forecast for later today so I am hopeful. At Tag Tuesday the theme is A Night at The Movies chosen by Joan and I wanted to do a tag of my favourite film ever--I still have a copy of it on DVD and it never fails to make me very happy when I watch it. As all forms of tag are acceptable for the TT challenges. I made a digital one this time. I was singing the songs from the film as I constructed the tag. Art Journal Journey have a great theme this time chosen by Gill. All you need to do is make a journal page that shows something or someone that has inspired you. I did a page for my digital journal. It was influence by the work of Gary Saunt that I find fascinating. He uses his own photographs of local places, as backgrounds and adds allsorts of things to them. 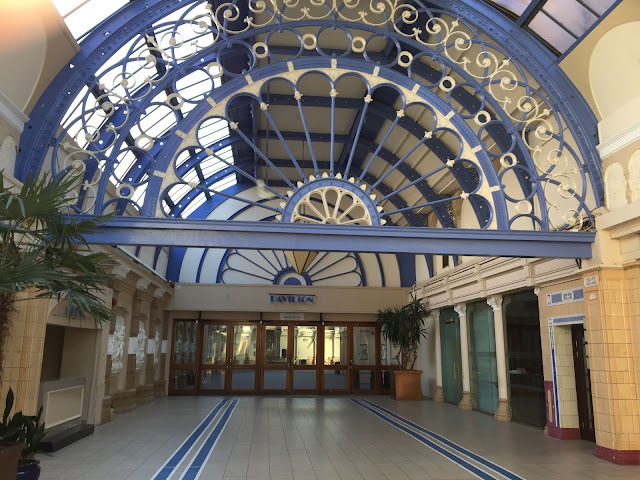 I used my own photograph of the Winter Gardens in Blackpool. That always inspires me whenever I go in there. I added lots of things including Vic wearing of my owl teacosies that he decided may make a nice hat? No wonder they are all looking his way. One of Gary's pictures called Beverley Station. 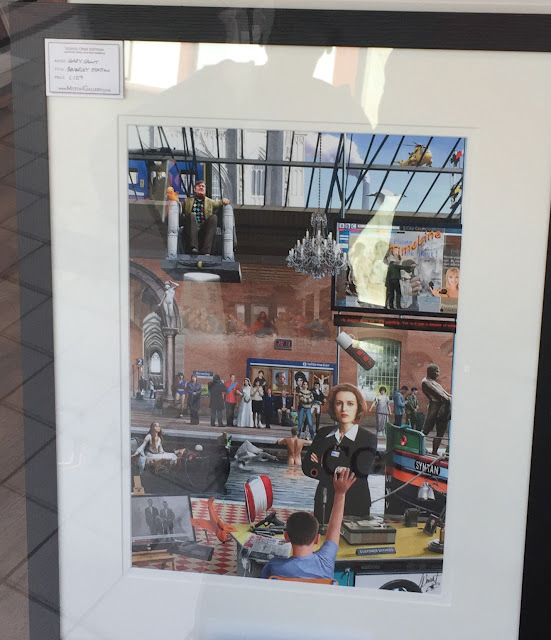 I would have loved to have bought it but it was a bit pricey so will have save up. What a wonderful post today, Chrissie. I haven't seen the film, but sure it is charming depending on how you interpreted it. Lovely! Vic looks really cool with her 'handmade hat' :) Thanks for sharing nice photos. Here it's sunny but a bit cool weather. I remember seeing this film on TV back in the late 1990s. I don't remember much about it, except it seems there was lots of dancing. The tag is perfection, though. I'd never heard of Gary Saunt, but I can see why you were inspired by his work. He certainly fills his art with many recognizable images. I enlarged the photo, and was surprised the cost of that work was not higher. I've seen crap sold at art shows that cost three times that and not 1/10th as interesting. Your art is beautiful, too. I loved that yours was equally appealing and interesting. Of course, Vic and his tea cozy hat was the hit of the scene. I liked the cat, too. Just like a "normal" cat (but unlike both of mine) to find the highest point in any room. This was a jewel. I was delighted you chose to share it with us at Art Journal Journey today, dear Chrissie. Great tag Chrissie - haven't seen that film for many years. My old favourites are 'The African Queen' and anything with James Stewart or Katherine Hepburn. I hadn't heard of that artist and will go back and have a proper look - but it looks fun and surreal what he does and you have captured that brilliantly on your page. Thanks for sharing what inspired you and joining in at AJJ. Both pieces are fantastic dear Chrissie! I don't know that film but your tag looks superb in my mind and the Art Journal page is just incredible! 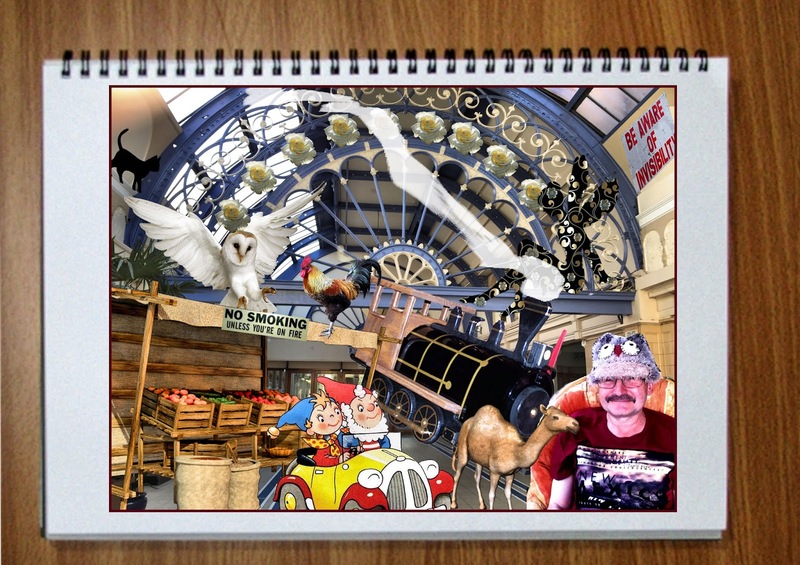 A fantastic digital fun and with Vic as focal point with his amazing hat you achieved exactly the same feeling as the artwork that inspired you! Indeed! Super to see you linking to Gill's great June theme over at Art Journal Journey! Both your digital projects look fantastic Chrissie. I remember that film so well. Your journal page looks awesome, I love how you used all those images and photos to create this page. Vic looked very fetching in his tea cosy hat. I'd not heard about the artist you were inspired by, his work looks great. A fabulous tag and journal page, Seven Brides For Seven Brothers was one of my favourite films, I use to have the LP of the film and I use to sing along to it. What wonderful artwork you've shared!!! Love your digital tag and journal page too! Lovely tag Chrissie, that's a film I had forgotten all about, I think we are showing our age. Love the digi page, love Vic's hat, and another reminder, Big Ears and Noddy. 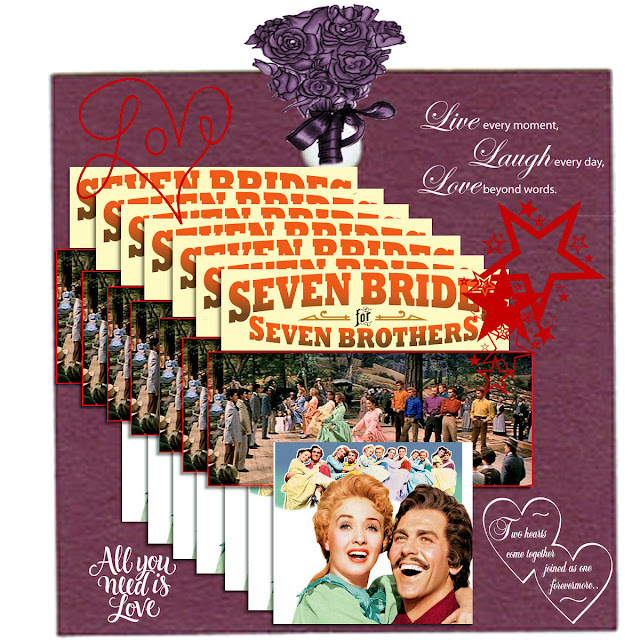 Seven Brides is one of Cestina's favourite films - love your cascade of posters. They used to have the big dance sequence showing on a loop all day on one of the big screens at the Museum of the Moving Image - I would often drop by just to watch the brilliance! Fabulous photo collaging - that ceiling is wonderful - and great to see your art inspiration too. So sorry I've been missing so much... I really hope to do some proper catching up soon. Great work Chrissy. I haven’t stopped by in a while. It’s great to see your still creating. I stopped by to see if I have been missing any of your posts Chrissie. haha!!!! Seven Brides for Seven Brothers! My mom made me watch it when I was a kid and I loved it! It was on TV the other night and I was appalled that they took all those women by force! LOL! !